In case you missed it, there was a fun article in the fashionable Home and Garden section of last Sunday’s San Francisco Chronicle celebrating Bernal Heights, and the local tribe of enthusiasts from the Bernal Heights History Project who bring our neighborhood’s past into the present. Michael Nolan’s home on a rolling block in San Francisco’s Bernal Heights is filled with the past. Black-and-white photos from his youth hang on the walls and family keepsakes sit on shelves, but they’re mixed in with neighborhood artifacts, like railroad tools from the late 1800s found buried in Nolan’s backyard. A passionate genealogist and the convenor of his family reunions, Nolan is now focused on building a different kind of family tree: the genealogy of his house. Nolan, 73, is one of many Bernal Heights residents hooked on recording the history of their homes and the neighborhood. Some homeowners might conduct this type of research during a renovation, to replicate the design features original to the property. But these self-made historians want to connect the present with the past, when neighbors were close friends and felt a strong sense of community. Bernal Heights lies between highways 101 and 280 near San Francisco’s Mission District. More than 24,000 residents live in this colorful community filled with coffee shops, restaurants and views from every hilltop. The area contained few homes until the 1906 San Francisco earthquake, when many were drawn to build on its stable bedrock. Now a dozen earthquake shacks, which were used as temporary housing after the 1906 quake, sit near modern, contemporary homes interspersed with updated Victorians and smaller, old cottages built in the late 1800s. Walker lives on Ellsworth Street just a few blocks from Nolan […] and she’s equally immersed in learning about her home. Walker has traced the name of every owner of the Ellsworth Street residence, which was built in 1927. Her first bit of data came in 2003 on the day she moved into the home. Her husband, Wade Walker, was unloading the moving van when a neighbor came by and shared an unexpected gruesome detail: The property was the site of a 1976 husband-wife murder-suicide. 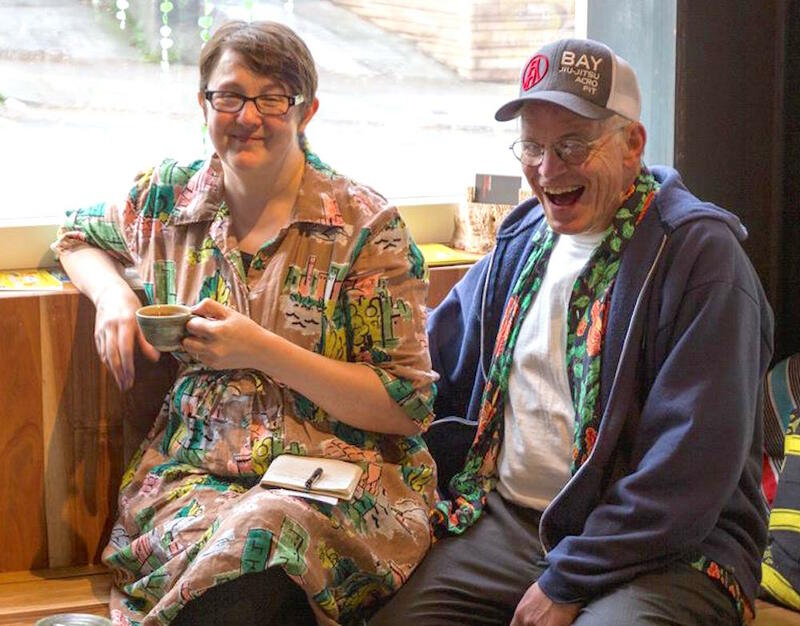 PHOTO: Above, Vicky Walker and Michael Nolan at Pinhole Coffee last February, via Michael Nolan. 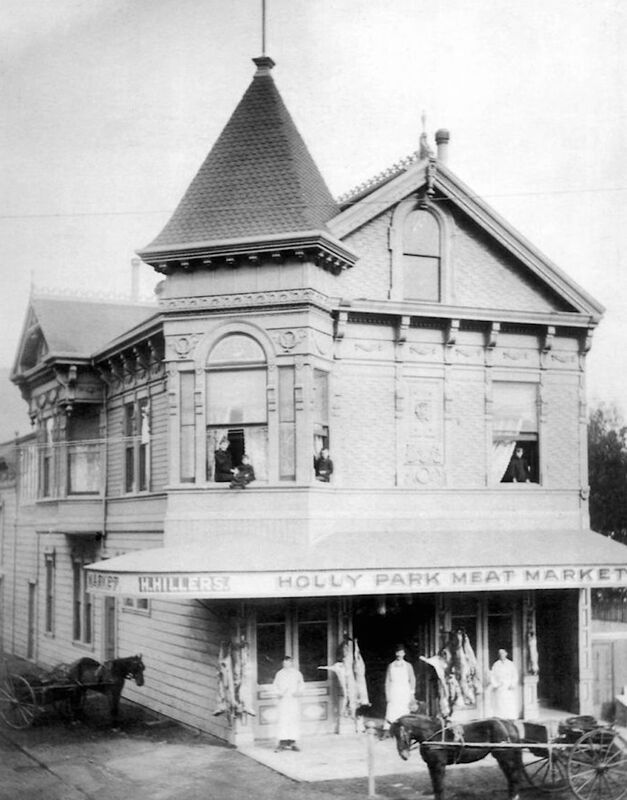 Below, Holly Park Meat Market at 231 Cortland Ave, current site of Pinhole Coffee, date unknown. Vicky Walker and Michael Nolan deserve all the accolades! I’m a grandchild of the residents of 17 Bennington street. It was where my dad was born in Dec. 1901. He often spoke about their survival of the 1906 earthquake. Does anyone know the people living in that house now? Bob, you can drop us a line at info@bernalhistoryproject.org and we’ll load you up with information! We’re lucky to have them both here.